The Suunto D6i is a dive computer for the serious diver, sitting at the higher end of the pricing spectrum with features and style to match budget. I’ve always very much been of the opinion that you get what you pay for and the Suunto D6i meets that expectation, in my view. Here’s a rundown of features and my review. The Suunto DM5 software can be used with the D6i computer, so you can log key metrics from your dives and keep track nice and easily on PC and Mac. How easy is it to use? None of us want to be distracted when diving by having to faff around with a complicated piece of kit. How does it look? Sorry if it makes me shallow, but I really do care how a dive computer looks. It’s ridiculous, I know, considering I don’t pull off the whole wetsuit or drysuit look particularly well. The least of my concerns should be my dive computer, but as a gadget fan, I care about the design of these things! How comfortable is it? I’ve had some dive computers that I frankly couldn’t wait to get off my wrists! That’s an absolute fail, in my book. How do the features stack up against dive computers of a similar price range in the current market? In other words, how much value for money does it represent? I received the Suunto D6i black steel as a gift and wore it on a dive a week later. I’ve now worn this computer on 2 dives. I tend to default to a cheaper computer, funnily enough. The ScubaPro Chromis tends to be the computer I reach for first on dives, unless I’m specifically looking to review a new product. But after the first dive, I felt inclined to give the Suunto D6i another go on a dive the week after. In fact, I think the computer could oust the Chromis as my go-to gadget. In terms of ease of use, this computer is cracking. It’s very simple. If you’ve been accustomed to using any of the modern computers on the market, you’ll probably be able to get started without reading the instruction manual from cover to cover, which is always a bonus. Of course, though, I’d always suggest you do read the manual first – particularly for something as crucial as this potentially life saving piece of scuba diving gear. I also quite liked the look of it. It’s not as modern and fresh looking as my beloved Chromis, but it is slick looking. And it does have the benefit of being watch sized so I was happy to wear it travelling to and from my dives as well as during. 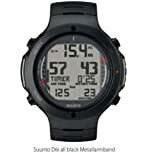 The 4 dives modes within the Suunto D6i and wireless air integration were particularly notable features and the backlit display was sufficient even in poor visibility conditions. I wasn’t distracted by trying to use the computer and found it very easy to get the information I needed quickly and easily. And I found the Suunto D6i to be perfectly comfortable. All in all, this is a good computer. In terms of value for money, however, I’m not convinced it does totally meet the expectations that its price tag might set. It does have some functionality that the Chromis doesn’t, but with an RRP of £914 – £1,150 depending on the model, you’re quite right to expect something pretty immense. The reality is that the Suunto D6i dive computers are retailing now from £695 to around £895, so you don’t have to pay in excess of £1,000 for one. Nonetheless, they’re at the higher end of the market price wise and although I found the Suunto D6i to be comfortable, easy to use and pretty decent looking, I don’t know whether I am convinced that it really represents value for money when compared to other models on the market. I feel as though you can get this functionality in other models at a lower price. That said, it’s a good computer and I don’t feel disappointed by it either. 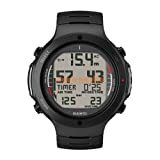 If you do decide to buy a Suunto D6i dive computer and you would like to give us your own review of the product, please do get in touch! I always love to hear of other divers’ experiences with the products I’ve been using. Previous Post:Does Scuba Diving Burn a Lot of Calories?